After the mosquitoes came the acorns! 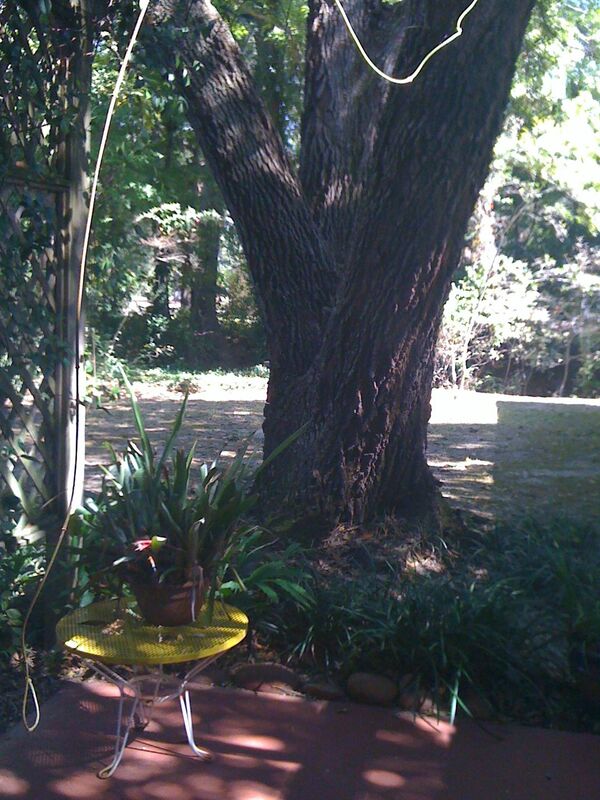 I mean, my first glimpses of home in New Iberia, Louisiana were of the maringouins fluttering against the pane of my study, and when I glanced at the floor of the dusty patio, I saw a carpet of acorns – whole, half-eaten, broken shells – and more raining down from the Live Oak beside the house. The acorns comprised a bumper crop, the products of a “mast season” in the acorn realm. Sweeping, chloroxing the patio floor, shaking my fist at the squirrels and the jays causes no cessation of the acorn rain. Both jays and squirrels are aggressive and jeer at me from their perches in the live oak, throwing down the shells of the nuts hourly. Acorns of White Oaks at Sewanee are elephantine compared to the nuts that fall from my Louisiana backyard oak, but the result is the same – the feel and sound of acorns crunching underfoot and littering daily. In my readings about the acorn, I find that most acorns are garnered by birds (especially jays and woodpeckers) before they fall to the ground, and they also provide tasty fare for mice, wood rats, and pigs (? ), although I haven’t seen the latter rooting in the yard yet! Armadilloes, yes; pigs, no. The tannins in acorns agree with the digestion of some animals, but we aren’t among them, unless the nuts are soaked in water for awhile so that the tannins leach out. California Native Americans once fought over trees that bore acorns low in tannins and sweet in taste. I haven’t spied an acorn woodpecker yet, but these birds subsist on acorns where several species of Live Oaks grow close to each other and produce abundant crops of the nut. 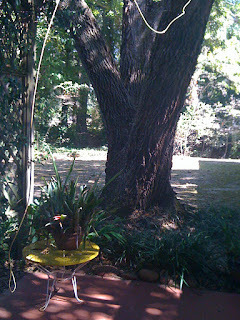 Acorns also attract wasps, and I’ve spied a few of their nests near the patio since returning home to Louisiana. Birds sometimes eat the wasp larvae for dessert following a meal of acorns. Recipes using acorns abound – acorn flour honey cake, acorn pasta, roasted acorns, acorn soup, to name a few. As for me, I’ll sweep the “mast crop” into the backyard for the jays and squirrels and leave the remainder of the harvest for old hippies to eat! I’ve written short suspense stories during my career as an author, but not in the form of a “prequel,” a sort of teaser for a book already published. However, when Isabel Anders, co-author of Chant of Death and editor of a Kindle ebook, An Essential Evil, presented the idea to me, I spun out a short suspense story before I left Sewanee, Tennessee. Since many readers have asked for more background about Father Malachi, the protagonist in the short story’s sequel, Chant of Death, Isabel and I focused on this character as the central figure for a prequel in a Louisiana setting. 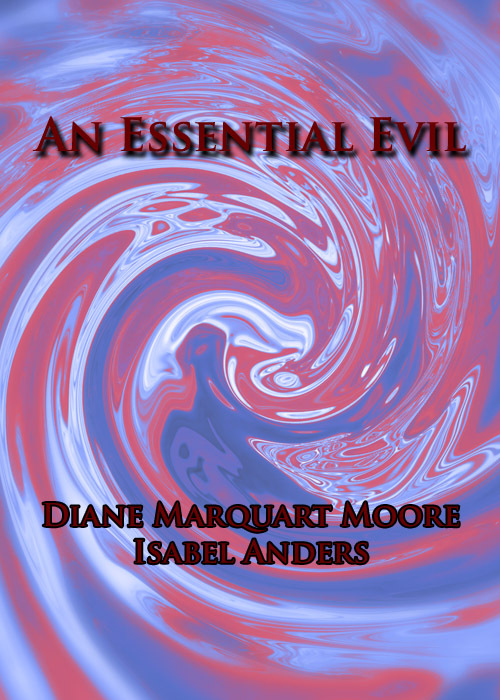 In the prequel, An Essential Evil, readers are introduced to Malachi Marchand, a clinical psychiatrist in his life prior to becoming a Religious and his problems concerning his deranged wife, Virginia. Malachi’s relationship with his bizarre spouse almost seems to be an “essential evil” that leads him into a vocation at St. Andrew’s Abbey in southern Louisiana. The route into this monastic life is a deeply disturbed one involving the bizarre murder of a dog, an exorcism, a suicide, and Malachi’s crisis of spirit following his wife’s death. 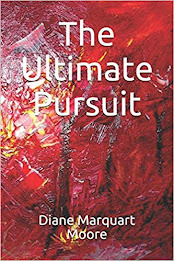 The prequel is available only in Kindle format and can be ordered from Amazon. Its sequel, Chant of Death, was published by Pinyon Press in Montrose, Colorado. One sound I missed while sojourning in Tennessee this Spring and Summer was the long whistle of a train going through the countryside during the night. At one time in my life, the wail of a train whistle at night caused me to feel lonely, as if I had boarded a car going Nowhere. Now, when I hear the whistle, I think that I’ve boarded an express to Somewhere! I guess you could call this progress, albeit somewhat romantic. The most perilous train ride I’ve experienced was on a long journey, via the Trans-Iranian Railway, that took us over desert terrain in Ahwaz to mountainous areas near Tehran, Iran, stretching from the Persian Gulf to the Caspian Sea. In Richard Frye’s classic book, Persia, he writes that the railroad was “finally finished in 1938 after great engineering difficulties over difficult terrain…” I think that this is a mild description of the terrain from Ahwaz to Shemiran, a section of Tehran in the Elburz Mountains. After a night of wakefulness among Iranis celebrating the Friday Sabbath with beer and shish kebab (!) and glimpses downward at the yawning abysses on either side of the track, we stopped at Qum about daybreak , and I found comfort in an estekan of tea and nahn spread with orange marmalade. I wish that I knew the dimensions of the train track through the mountains because it seemed as if we were on rails as thin as the lines depicting them on a map of Iran. 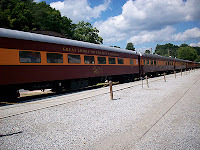 My daughter Elizabeth traveled by train this Spring from California to Tennessee and arrived after three days of travel sitting up and breathing hot air that she claims caused a virus to develop in her and my grandson Joel. We went to Birmingham, Alabama to fetch her, and the rundown train depot across the street from a decaying building with broken window panes inspired in me the disappearance of all vestiges of romantic notions about train travel. into the “whoo” of memory. 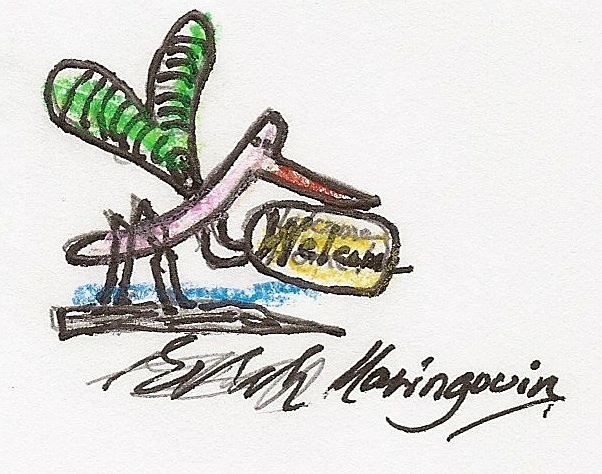 When I sat down at my desk in New Iberia after a hiatus of several months, the first beings to welcome me home were mosquitoes dancing against the window pane overlooking the backyard. “Welcome back,” they said, “we’ve been waiting for your allergic skin as it has always been the type we enjoy sampling.” Yes, it’s welcome back to the land of the mosquitoes, bayou country, Louisiana! However, I understand that I escaped the worst influx of them last month following several tropical storms. Actually, New Iberia, Louisiana was the site where the scourge of yellow fever (mosquito-bred disease) struck twice during the 19th century. According to Glenn Conrad, author of New Iberia, yellow fever was introduced into Louisiana during the 1790’s, arriving in New Orleans via a ship from a Caribbean port. 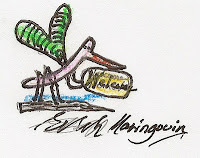 The ship carried pesky mosquitoes in its freight, which was transferred to steamboats plying the Louisiana bayous. In September, 1839, New Iberia experienced its first epidemic of yellow fever. During the onslaught of the disease, a black woman named Felicite, a native of Santo Domingo who lived in New Iberia and was immune to the disease, cared for the sick and dying victims, and even arranged for their burials. A plaque commemorating her caretaking stands on the parade ground between the Iberia Parish Library and the New Iberia City Hall. Yellow fever disappeared from Teche country following the Civil War, but in July, 1867, another epidemic struck New Iberia, and nearly two-thirds of the city’s population suffered from the disease. “The list of dead included someone from nearly every household in the town,” Conrad reported. By October of that year, the disease disappeared from New Iberia. When Yellow Fever appeared in Louisiana during 1878, New Iberians adopted preventative measures, burning sulphur, disinfecting, and quarantining, and somehow escaped the epidemics that had left 4,000 dead in New Orleans, over 100 in Morgan City, and nearly 200 in Baton Rouge. Conrad reported that few people realize that the last reported and authenticated case of yellow fever in the U.S. actually occurred in New Iberia, in 1906. A young teenager was treated by several yellow fever experts from New Orleans and recovered. Until the turn of the century, Louisianians didn’t recognize the connection between frequent summer showers along the Gulf coast, warm, humid days and nights, the arrival of hordes of mosquitoes, and the onset of yellow fever. Citizens also failed to make the connection between the disappearance of the dreaded “maringouins” during the first cold days of Fall and the occurrence of frosts that ended yellow fever epidemics. Just last month, Iberia Parish experienced an increase in species of floodwater mosquitoes due to tropical weather, and aerial mosquito spraying took place. Residents of the parish were told that if they heard low-flying aircraft overhead, they weren’t mosquito bombers but aerial mosquito sprayers, and residents shouldn’t look up for obvious reasons. I’m glad that the population of this species has been decimated because these mosquitoes have extended flight range and are numerous and aggressive biters! And such is the character of my winged welcoming party when I arrived in “The Berry” a few days ago! 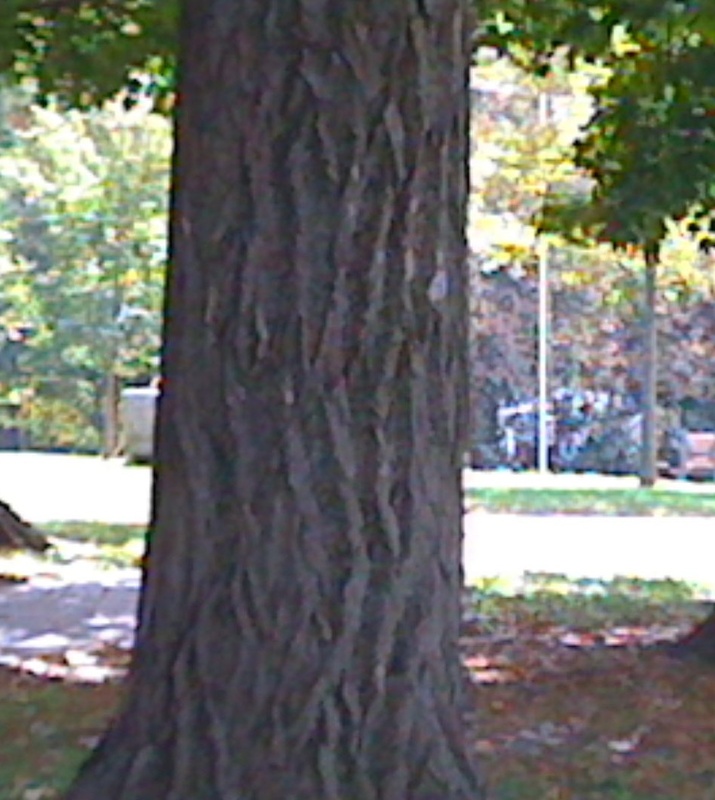 Yesterday, my botanist friend, Vickie, led me to a site in front of Convocation Hall here on the Sewanee campus, where the Bentley Bells and chimes ring out from Breslin Tower, to show me a beautiful tree whose attractiveness was overpowered by a rancid butter odor. The Ginkgo biloba or Maidenhair Tree, that occupies this site had dropped a gracious plenty of seeds on the ground, and although I stepped carefully on the lawn around the perimeter of the tree, I brought home some seed on the soles of my sandals and had to do a major clean-up to get rid of the unpleasant sour smell. At the time of the sighting, the tree hadn’t turned its golden autumn color, and its stature indicated that it had guarded the old hall for years. I imagine that most people walk on the sidewalk beside the Gingko, rather than crunching around on the ground beneath it as I did during my investigation, which caused the unpleasant vapors to rise into the air. The smell lingered for half a block. The Gingko tree in Europe was first sighted by German botanist Engelbert Kaempfer in a Japanese temple garden during the 17th century. It’s a living fossil dating back 270 million years, and at the end of the Pliocene Era during the Ice Age, it disappeared, except in an area of Central China where Buddhist monks are said to have saved the tree from extinction. Today, some species in China tower to heights over 164 feet. The Gingko tree possesses strong survival characteristics, withstanding heavy winds and snow damage, two weather conditions prevalent at Sewanee during the winter seasons. 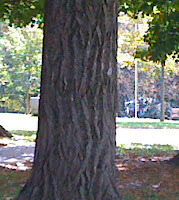 The tree has been cultivated in North America for over 200 years. Gingko trees are designated as dioecious – in other words, the trees are either males or female. The females produce a seed that is yellow brown and fruitlike, not unattractive in appearance, but it’s the culprit that contains butanoic acid which emits an unpleasant smell like vomit. 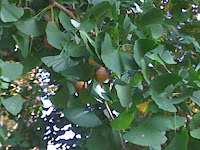 In an interesting article about the Gingko, an Iowa City office manager complained about a Gingko tree growing in front of her business that caused a slimy mess and which she described as emitting a smell that was “pretty disgusting.” Throughout the U.S., some city councils and businesses have removed female Gingko trees, leaving the “non-stinky” male trees in their environments as they’re excellent shade providers. Incidentally, Frank Lloyd Wright acclaimed the Gingko as his favorite tree. 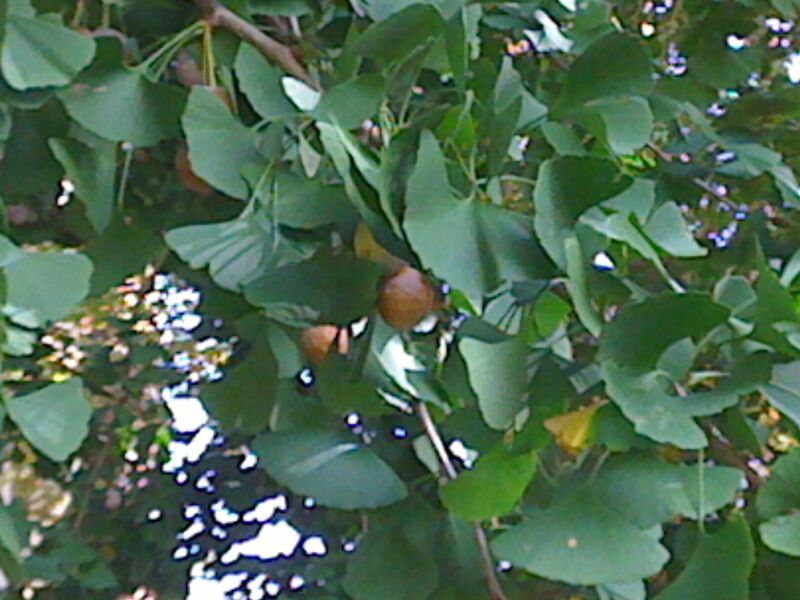 In defense of the smelly Gingko (the national tree of China), extracts of Ginkgo leaves contain flavonoid glycosides and terpenoids (ginkgolides, bilobalides) that are used to treat dementia. Gingko is believed to be effective in enhancing memory in humans and as an anti-vertigo agent. Also, Gingkolides are used in treating and preventing cardiovascular and central nervous system diseases. Six Gingko trees, still alive and well, that survived the 1945 atom bomb explosion in Hiroshima, Japan attest to the durability of these wonderful trees. I don’t know how old the Sewanee Gingko tree is, but some botanists predict that Gingkos can live 3,000 years! In Oriental cultures, the Gingko tree represents changelessness, as well as unity, hope and love. One of the sights at Sewanee I’ll miss when I return to Louisiana next week is that of the deer that graze in the woods behind our cottage and near our front porch in the evenings. Although they usually ruin the flower beds we plant each Spring and pluck the blueberries before we have had a chance to harvest a few from our bush, I still like to see them and even talk to them when they graze close by. Last week when I read an article in the Sewanee Messenger about deer management and culling, I felt a twinge of guilt about my romanticizing deer visits to our “domain.” The author of the article, Leslie Lytle, reported that management studies indicate the deer herd on The Mountain must be reduced by forty percent, resulting in a harvest of 236 and in reduction of the doe/buck ratio to 3:1. She stated that from 1700-1900, excessive deer hunting almost decimated the white-tailed population in this area, but we certainly see a gracious plenty of them on The Mountain now. Designations like “Biological K” define the number of deer an area can sustain before disease and starvation affect the deer population; while “Social K” defines how much nuisance we humans on The Mountain can tolerate before a deer cull is called for. Lytle cited destruction to gardens and landscaping (such as our small flower beds), the incidence of Lyme disease from deer ticks, and “loss of biodiversity due to excessive understory vegetation” (the small woods fronting our property) as nuisances that call for culling. The deer population at Sewanee seems to be approaching “Biological K” and has passed the “Social K” boundaries. So the hunt is on! The archers have sharpened their arrows and begun deer culling. Already, I see less and less does and more fawns nibbling the understory in the woods and trimming my lawn. trying to woo her closer. and a fragile grace filling moments behind. nibbling at the last light of day. the cautious welcome she once ignored. vanished at the dinner hour. we cannot keep each other.